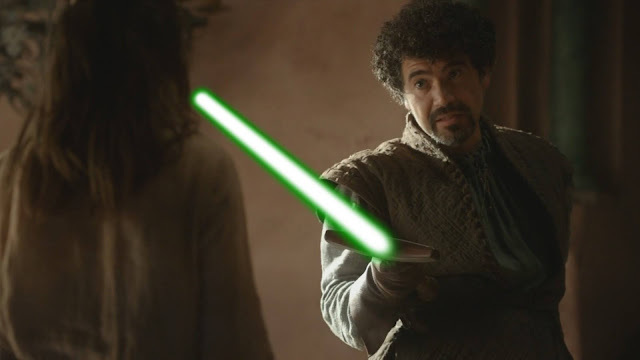 Although it has yet to be confirmed officially, it has been a long know fact that Miltos Yerolemou of Game Of Thrones fame has a role in The Force Awakens. We've know nothing of who or what he could be playing in the film, but a new report released today could give us some clues. The Star Wars Post has uncovered a new tweet from BBC's Lizo Mzimba, who originally broke the news of Yerolemou's casting back in September of last year. He points to the actor's spotlight page( similarly to some Rogue One Casting news we got earlier this week) as his source. Apparently Yerolemou is credited as "HM Patron" in The Force Awakens. And if that sounds like an odd name for a character, you'd be right, because it's most likely not his name. Some possible SPOILERS may follow. “Maz Kanata’s pub inside the castle, as shown in the Vanity Fair piece recently, was code named the “Hall of Mirrors.” I think this does narrow down which part of the film Miltos participated in and it begs the question does he just sip a drink or do we get to see some of his sword skills on screen? I imagine Miltos will remain named “HM Patron” until an action figure or visual guide of some sort names him”. The particular Vanity Fair photo he mentions is the one you see above. It will be interesting to see how big of a role Yerolemou will play in the final film and how he will fit in amongst the diverse collection of aliens seen in the photo. Of course all of this is rumor and speculation until it's officially confirmed by Lucasfilm, or when we can actually pick him out on screen when The Force Awakens hits theaters December 18th! i think he IS the red dude.